To escape a stalker, preacher's daughter and bad luck magnet Jean 'Jinx' Honeychurch leaves her loving, middle-class family in wholesome Iowa and moves in with her super-rich aunt, uncle and cousins in glamorous New York City. It's been a few years since she's seen them all, and they've changed -- especially her cousin Tory (call her Torrance -- or else), who is now into drinking, smoking and drugs, is quite the fashion plate, and oh, wait, thinks that she's a witch. Okay, basically? 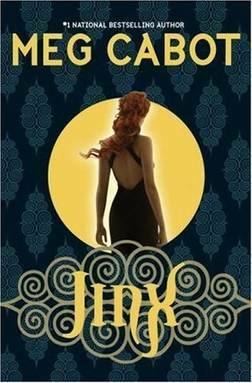 Jinx is a cross between The Craft and Gossip Girl*, and both of those do it better. So just... set up two TVs and watch them both at the same time or something. I was surprised at how much I didn't like this book, especially considering the fact that I usually like Meg Cabot's supernatural stories (huge fan of the Mediator series, loved Avalon High, liked the 1-800-WHERE-R-U books, but never got around to finishing the series). But all of the plot 'twists' are easily visible three miles away, Jinx's 'mysterious' trouble back home was even more obvious than obvious, and the romance itself was flat. Flatter than flat. Not only was there no real spark between the romantic leads, there was no real spark between the sparring cousins, or... anywhere else in the book. It plodded. Also, I'm really, really over the dreamy-guy-so-clearly-likes-girl-that-everyone-else-notices-but-girl-doesn't-know-until-the-very-last-page plotting choice. I'm sure that this one will be popular, as are all of Meg Cabot's books. But, wow. I felt like she was phoning it in this time around. She can do better -- or, at least, she has in the past. As she tends to range, content-wise, I will mention: Little-to-no swearing (that I noticed), pretty chaste (Big Kiss at the end), drug & smoking/alcohol use, but not by the Good Girl. Oh, and an attempted suicide (sort of) and a scene near the end with some pretty serious threatened violence. *From now on, when I mention Gossip Girl in a positive light, just assume that I'm talking about the show, 'kay? It was just announced that the show got a full-season pickup, by the way. On book events for teens. Jenny Valentine* on winning big.